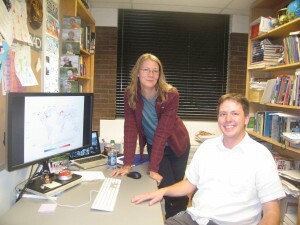 Two professors in the Department of Geography-Geology have been receiving extensive press coverage for a recent paper. Catherine O’Reilly (lead author) and RJ Rowley, along with 63 other co-authors, published “Rapid and highly variable warming of lake surface waters around the globe” in Geophysical Research Letters on December 16, 2015. The study examined 235 lakes using hand- and satellite-measured surface temperatures over a 25-year period. The data were published separately at Scientific Data (Nature), and both papers are open access. The study reports that many lakes are warming faster than air and oceans, and that this high warming rate will have negative consequences for water quality. Media reports have appeared in newspapers, online, radio and TV in many countries around the world. The National Science Foundation, which provided some of the funding along with NASA, has tracked that the story has appeared in over 400 media outlets, making it one of their top reported research projects according to NSF Program Director Tim Kratz. Notable outlets include Science, Nature, Toronto Star, Washington Post, Christian Science Monitor, International Business News, Financial Express, the Huffington Post, and Fox News.